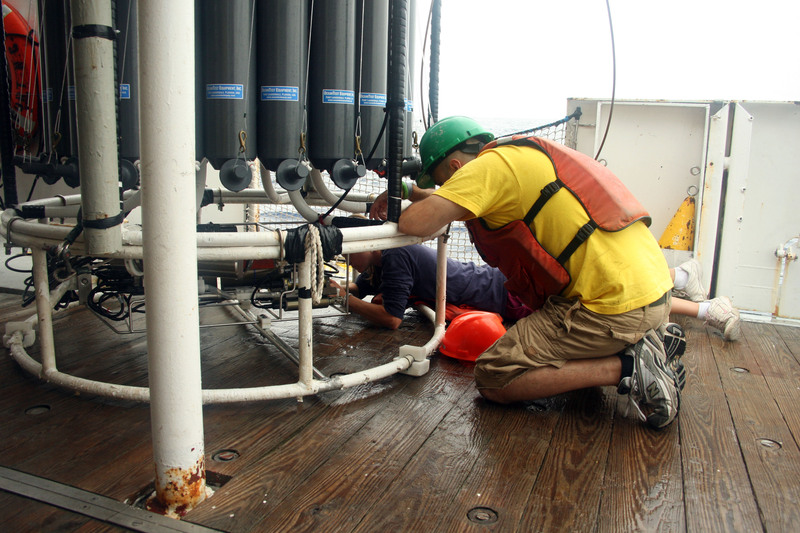 Two weeks at sea is all some oceanographers get to do all of their fieldwork for the year. Two weeks, give or take a grace day, including whatever Mother Nature has to throw at the ship. Granted, it’s work 24 hours a day, likely running several experiments at a time. But compared to some brands of science, two weeks is barely enough to say you know what system you’re working in, let alone describe ecological processes at work. To me, someone who employs anthropological methods just as often as ecological ones, anything less than a year doesn’t count as fieldwork. I’m not judging; it’s just a difference in philosophy and feasibility. After participating in one of these two week cruises, I am no less in awe that our understanding of the ocean comes from such a philosophy. Achieving solid results requires such a carefully orchestrated dance in order to work, I’m shocked that we got as much out of the cruise as we did. First, the data collected relies on connections to other data from both a larger time scale and a larger geography. The collaboration necessary to get these data and the standardization of methods in order to make them compatible is quite frankly astonishing in a world that is often more competition than collaboration. I’m not sure how the standard methods became standards – if someone sat down and planned data sharing or if it just happened over a few years (or decades) of necessary data sharing. However, it’s now to the point that one member of the cruise commented “whoever made these cryotubes [to hold samples frozen in liquid nitrogen] is probably a millionaire because they’re such a standard piece of equipment”. The two labs on board also had exactly the same types of test tubes, water carboys, filter paper, and pipets, among other things. Perhaps most astonishingly is the need to deal with weather during the time. The way applying for ship time works is that every hour, almost, is accounted for in the funding application process. Organizations scheduling ship time can’t leave “just in case” time for days in which the working conditions are nearly impossible. Needless to say, however, people can’t send anything overboard or even go outside when large waves are washing over the deck. Depending on the stomaches of the science crew, even less stormy days can mean a day of no work if people are sleeping through seasickness. In lucky cases, these lost days can be accommodated by a few transition days left between cruises, but it’s not something to count on. A lost day in a tightly scheduled trip either means no sleep or no experiment. Both are equally likely to happen. In our particular cruise, it meant no sleep and running two experiments concurrently. The experience didn’t kill us, but it was stressful and involved some very tight working space in the lab. 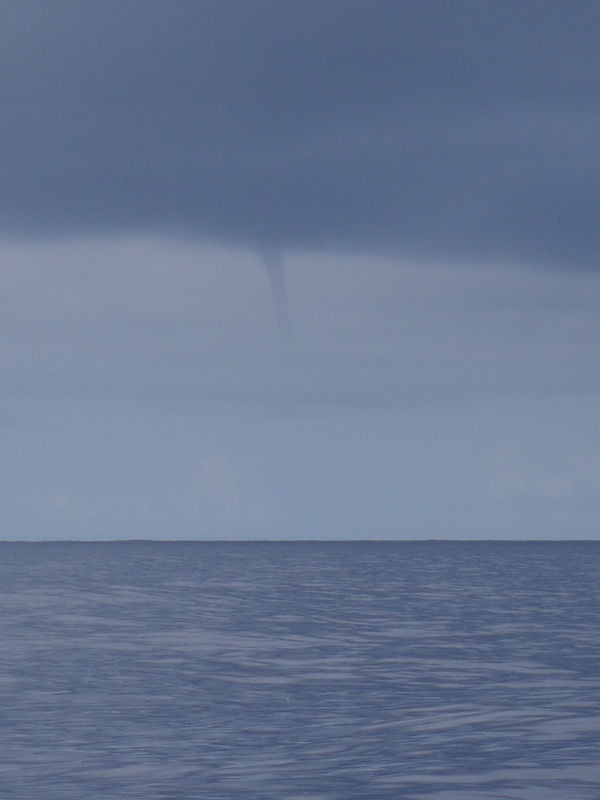 Several of the senior scientists on our cruise described the “cruise cloud” that occurs – the slightly foggy thinking that is pervasive due to lack of sleep from night watches, doses of Dramamine, and attempting to coordinate several projects at once. Given this, which I can attest I also experienced, it is even more amazing that some cruises can make press statements during their cruise. Think, for example, of scientists working in the Gulf on the oil spill. 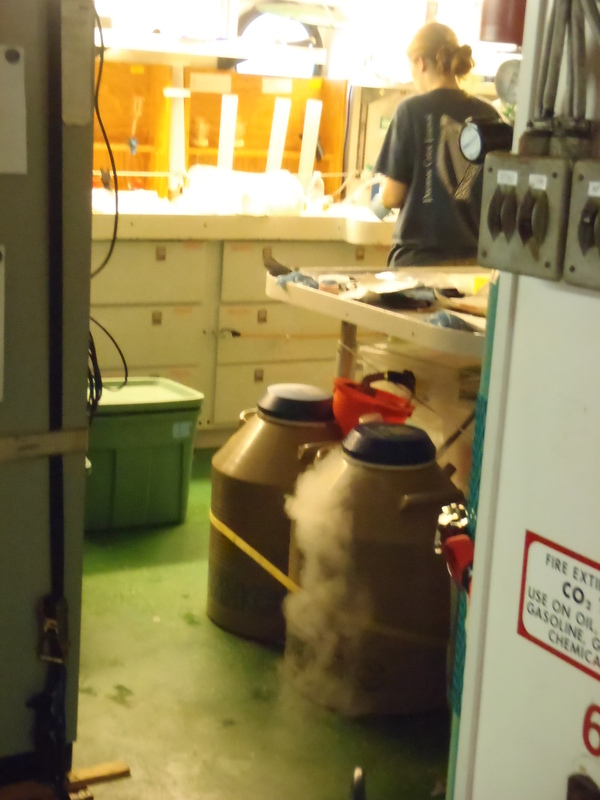 The flipside, of course, is that all oceanographic fieldwork is paired with years of labwork. Half the game of work on ship is to collect and preserve samples for later analysis. It doesn’t remove the need for collaboration to increase the results’ scope, but each conclusion made from ecological observation and experiment on deck is then ideally paired with molecular evidence. For followers of the Sargasso Cruise, I won’t be part of this later analysis, but suffice it to say that’s where the real brain power lies.